The first Aesop signature store in Munich, located in the historic Luitpoldblock shopping centre, exudes an atmosphere that oscillates between tension and harmony. Presenting the high-quality care products by this Australian brand, it combines brutalist elements such as the over-dimensional monolithic counter made from cast concrete with inlaid washbasin, or the tiered concrete ceiling and rough screed floor with an offset of soft and particularly high-quality materials. Thus, surfaces that are touched by the customer were designed to feature velvety polished marble. Vertical brass trapeze forms in front of the window supporting slim shelf boards made of Carrara marble as well as bronze elements and shiny velvet panels on the walls enhance the overall atmosphere of luxury and elegance and are reminiscent of the intimacy of a boudoir. The antique furniture invites visitors to linger, while a concrete washbasin area in the adjacent space offers the possibility for extensive customer consultation. 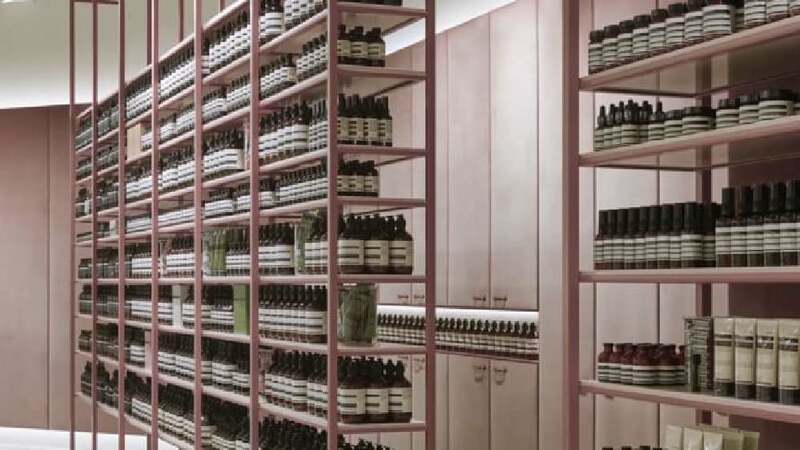 The Aesop signature store in Munich manages to create an impression of the highest quality through the skilful use of comparatively simple means. The successful interplay of contrasting materials such as raw concrete and screed on the one hand, and finest marble and velvet on the other, as well as the use of soft, powdery colours, all contribute to creating an exciting yet harmonious atmosphere of contemporary luxury.